The parish of Killybegs, Na Cealla Beaga, (The Little Cells, The Little Churches) has probably existed since medieval times in common with many other parishes in the ancient See of Raphoe. “The origin and position of ‘The Little Churches’ from which this parish derives its name are nowhere explained in ecclesiastical history or on the biographies of our saints. Tradition presents the village as dedicated to St Catherine as its patron when the ‘Little Churches’ or monastic ‘cells’ were first erected on its peaceful banks.” ( A History of the Diocese of Raphoe, E Maguire 1920). The original parish Church, situated close to St Catherine’s Well on the west arm of the harbour, was taken over by the Church of Ireland following the Plantation of Ulster, probably around the year 1610. From then on, during the penal persecutions, Catholics worshipped their God at the ‘Scathláin’ (shelters) which were often built over the Mass-rocks of which several are to be found within the parish. Around 1763 a new catholic church was built on the site at present occupied by a new development at the Old Niall Mor School. It was known as St Catherine’s. On Wednesday 10th July 1833 the Very Rev Edward McGarrigle, then Parish Priest of Killybegs, died. His successor the Rev William Drummond, a native of Ballyshannon, aged only 28, undertook the building of a new church. He was fortunate that he met the local landlord, Alexander Murray, a benevolent and Christian gentleman, who bequeathed him the site for his church. The architect chosen for this task was the landlord’s friend, John Buonarotti Papworth, of Marleybone, London. Tradition has it that the cost of the building was £7,500 and that the work was done by voluntary labour. Most of the stone was taken from the McSwyne Castle at St John’s Point. Many visitors to St Mary’s remark on the great illumination within the Church. “What is exciting inside is the volume – one great high hall, 100ft by 46 ft, opening through arcades of three immensely slender arches in the middle of each long side to the airy transept-like extensions of the hall.” (The Buildings of Ireland, A Rowan 1979). 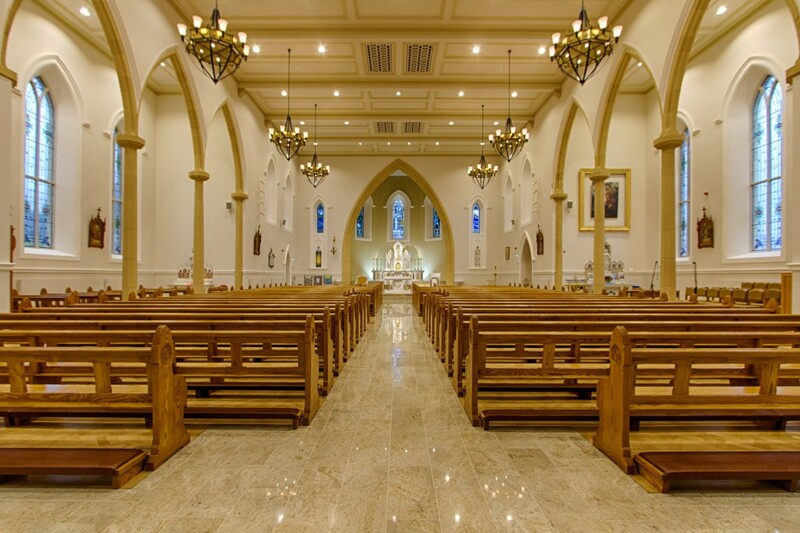 On full completion the church was dedicated by the Archbishop of Dublin Dr Cullen, on 6th August 1854. Some 20 years after the dedication three stained glass windows were placed in the chancel above the main altar. They were designed and constructed by a German firm called Meyer who did much ecclesiastical stained glass work in Ireland at that time. The centre window depicts St Catherine of Siena, on the left is featured the Mother of God and on the right the patroness of Killybegs, St Catherine of Alexandria. The sacristy which is built in fine cut stone was completed probably around 1880. In 1946 the stucco ceiling was replaced by a timber ceiling for safety reasons. The church bell, installed in 1951, was donated by Charlie Mc Intyre of New Row, Killybegs. Above the main entrance is a window (installed 1992) which tells the story of the ‘Calming of the Storm’ and is dedicated to the fond memory of those who list their lives at sea. On the outside wall of the church is a carved stone grave slab from the grave of Niall Mor McSweeney. Beside this is a stone (1994) placed there by the Donegal Historical Society which depicts the coat of arms of the Mac Sweeneys. St Mary of the Visitation Church, Killybegs, was added to the Record of Protected Structures by Donegal County Council on 1st December 2003.